The Construction & Engineering Team at Arthur Cox What’s Keeping us Busy? The construction and engineering team at Arthur Cox comprises a highly committed group of specialist lawyers advising clients on all aspects of law relevant to those working in this dynamic and ever changing sector. Much is going on in the sector and we are delighted to be a part of it. 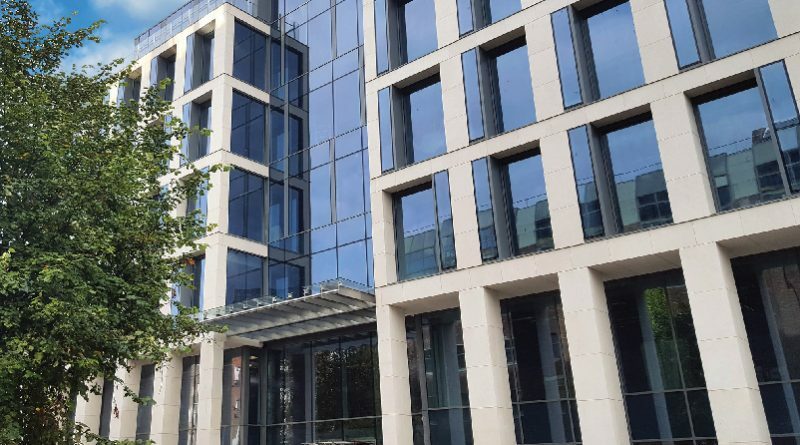 We, ourselves, have very recently located to beautiful new offices shown in the photo, at Ten Earlsfort Terrace, Dublin 2, close to our previous home and have experienced the excitement and challenges of procuring and constructing a new building first hand. We advise not only on the core issues arising on a construction project, ensuring risks are appropriately managed to enable the delivery of a quality project on time and on budget, but also on the legal and practical issues to be aware of, whilst also ensuring compliance with statutory requirements, such as health and safety and building regulations. Following the bleak years of the recession, we are now well and truly into a period of growth, with the construction sector a key engine in the economic recovery. As the economy continues to pick up, the vast bulk of the construction advices that we are involved in are non-contentious focussed on transactions and developments which are visible all around Dublin, and to a lesser extent, in other areas of Ireland. However, the high level of construction activity now will inevitably lead to disputes in the future, particularly as more significant construction projects move towards completion, which will begin to happen in a meaningful way later in 2017 and into 2018 and beyond. A glance across the horizon in Dublin tells a story about a sector which is on the up, a story reflected in the exponential growth in commercial, retail and residential development, the development of a new runway at Dublin airport, as well as the investment being made into Ireland by IT companies, such as Facebook, Google, Apple and Microsoft including through the development of significant new data centres, which itself is creating greater demand for sources of renewable energy. We can even now look forward to the development of our own Center Parcs holiday village in Longford! We can also expect a revitalisation over the coming months of the infrastructure and accommodation sectors, with growth in both third level education facilities and student housing, as well as investment in the health care sector and care homes. The current levels of activity are predominantly focussed in the private sector, and include commercial and residential development, retail and leisure, as well as wind and other renewable energy projects. We also see increased activity in the semi-state sectors reflecting a growing economy, for example, the construction of a new runway at the airport, and the development of a national traffic control centre by Irish rail. Public sector contracting continues but is far less dominant than it was a number of years ago, although public private partnerships are likely to have a renaissance later this year and into 2018, to deliver both accommodation and other key infrastructure facilities. In addition to the increase in activity in the sector, recent legislative changes have also raised new legal and practical issues to be grappled with and addressed, both in the appointments and contracts to be drafted and put in place, but also in advising on the day to day implementation of projects on the ground. The BCAR regime which ensures compliance with building regulations, and the introduction of mandatory payment practices and dispute resolution procedures, applying to contracts entered into since the middle of last year with the coming into effect of the Construction Contracts Act 2013, raise new challenges for everyone working in construction. So what types of issues do we encounter? The renewed tempo in the market means that there is pressure for developments to move into construction as early as possible and we see extensive use of letters of intent, often linked to a fairly advanced draft form of contract, but with key details and commercial terms remaining to be finalised. Carefully drafted letters of intent can provide appropriate protections for both parties to enable works to commence, but need to be limited in time and value to ensure impetus remains to finalise and execute a formal contract. We have also seen the use of more detailed pre-construction services agreements, which allow greater input from contractors into design and value engineering to achieve a better final product for the client and ensure cost savings and efficiencies for the benefit of both parties. Alternative pricing methodologies are also being utilised, with greater emphasis on mechanisms such as ‘guaranteed maximum pricing’ and pain / gain , again, to maximise both the inputs and outputs for both parties. Building Information Modelling (“BIM”) is also seen on an increasing number of developments, generally adopting the UK Construction Industry Council’s protocol to set out the key procedures and identify the key roles responsible for information management for the purposes of BIM. Care has to be taken in considering issues such as copyright and design responsibility, but most projects benefit hugely from adopting BIM, and in avoiding design clashes being encountered during construction. It also eases the production of as-built information at the end of the project. In the world of sub-contracting, nominated sub-contractors are largely a thing of the past, with even sub-contractors with design responsibility being domestic to the main contractor. As a result, both main contractors and their key sub-contractors will be required to hold professional indemnity insurance, even on projects delivered through the ‘traditional’ model, where the employer engages the design team. The Construction Contracts Act 2013 (the “CCA”) has presented some interesting challenges in terms of ensuring that contracts and appointments are compliant. Interestingly, there is only one standard form at present which takes account of the CCA, which is the PWC suite of contracts. The RIAI standard form of building contract is still under review and will take account of the CCA but the updated edition has not yet been issued. We have encountered a number of variations in the treatment of the CCA within bespoke amendments across a range of projects, adopting either the RIAI or FIDIC forms, as well as the JCT form (which we see used on an increasing number of projects). There is no absolutely right way to approach the incorporation of the CCA into contracts an appointments, and the approach taken may vary according to clients (for example, payment mechanisms may depend on the practices and practicalities which prevail inside the particular client) or the nature of the project (particularly with regard to the structure of the overall dispute resolution procedures generally, and adjudication in particular). With regard to the introduction of adjudication into the dispute resolution arena, there are different approaches being adopted, from a very light touch and a simple nod to the entitlement of either party to refer payment disputes to adjudication, to clauses running to several pages dealing with adjudication, some of which differentiate between types of dispute (namely, those that can be adjudicated, something which is yet to be determined, and those which are not caught by the CCA). The PWC has adopted a slightly unusual approach (which we see reflected also in drafting for use in the private sector) whereby if a dispute has been referred to adjudication, it cannot subsequently be referred to conciliation. Moreover, if a conciliation has commenced and one party refers a dispute to adjudication, the conciliation procedure is adjourned and is not resumed until a decision is given. (a) The performance of adjudicators – ultimately adjudication will need to represent an efficient means (in time and money) by which an ‘acceptable’ decision on the dispute can be arrived at. (b) The approach taken by the courts and the extent to which they will support the process and avoid getting pulled into the substantive issues. (c) The time taken for an adjudicator’s decision to be enforced – the value of adjudication will be lost very rapidly if it is not possible to enforce decisions quickly and relatively cheaply. Exciting times for all working in the construction sector!